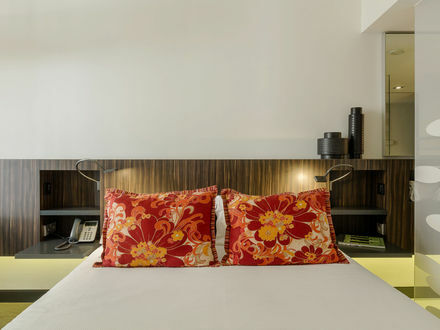 More than a 4-star boutique hotel, Inspira Santa Marta Hotel is a true oasis in the center of Lisbon. In spite of its location in an active and boisterous part of the city, Inspira Hotel offers all the tranquility required for your moments of leisure or business. All of our services, from the rooms to the spa, were designed based on the principles of feng shui, a philosophy that we believe represents our position of harmony regarding what surrounds us. Rooms come with decoration according to the feng shui element of our guests, and we also offer rooms specially designed for guests with reduced mobility. Sustainability is part of the Inspira identity,and for this very reason, the hotel prides itself on its policy of environmental sustainability which reigns across the entire project. This is reflected in aspects as the use of low environmental impact materials or the rational use of paper. Our sustainabillity policy also extends to our restaurant with regards to the quality and procurement of local produce and bestpractices implemented. Our restaurant, Open Brasserie Mediterrânica, offers Mediterranean cuisine and has gluten-free options on a daily basis. Whenever possible, we use organic products in the preparation of our delicious dishes. In short, you’ll find in our hotel inspiring and environmental friendly spaces where you can relax, but also carry out your personal or professional events without any concerns. 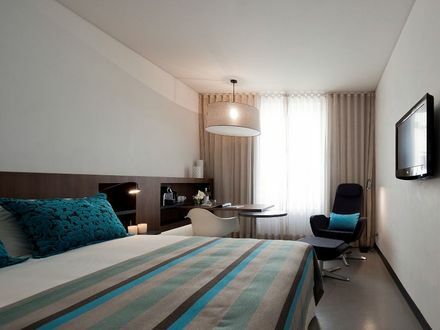 Take a deep breath and be inspired at Inspira Hotels! Comfortable rooms with one double bed. Meticulous decoration based on the harmony of the Feng-Shui’s 5 elements (Earth ; Water ; Metal ; Tree and Fire). The refreshing atmosphere, inspired by the colors of nature turns your stay into a real experience for your senses! Area of the room: 23 square meters. Non-smoking rooms. 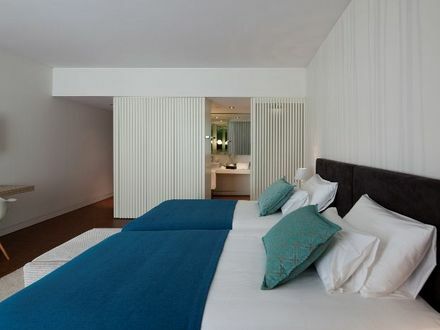 Comfortable rooms with a double bed. Tasteful decoration and harmonious based on five elements of feng-shui (Earth, Water, Metal, Fire and Tree). Invigorating environment, inspired by the colors of nature, a true experience for the senses! Room size: 23 sqm. Non-smoking room. 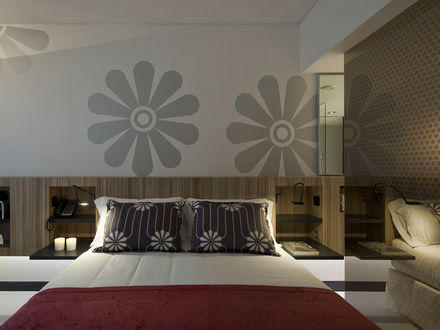 Spacious comfortable rooms with twin beds, urban and modern decoration. Rooms especially adapted for longer stays. Atmosphere inspired by the 5 elements of Feng-Shui (Earth, Water, Metal, Tree and Fire), perfect for one’s willing to reload batteries. In this room, every detail makes the difference. Area of the room: 30 square meters. Non-smoking rooms. You will love our Inspira Suites at first sight! They are spacious with a touch of glamour and all at once urban with innovative design. Inspired in the essence of the elements of Feng-shui (earth, Metal and Fire). They carry out an atmosphere of success and prosperity and are recommended for romantic break! Equipped with a separated living area and 2 flat-screen televisions. A real urban experience. 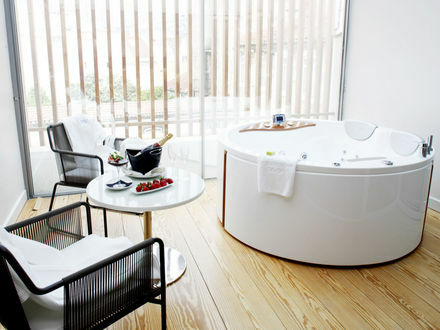 The most impressive detail of this suite is the rounded bathtub in the opened bathroom! Area of the room: 30 square meters. Non-smokim rooms. Our glamourous Grand Suites have 2 connecting bedrooms and can accommodate up to four guests. With innovative urban design this Suite recreates in its decoration the ancient philosophy of feng – shui. It comprises a set of 2 bedrooms (double and suite) 3 bathrooms, a separate living room area and separate 3 flat-screen TVs. This is the ideal place to enjoy a true urban experience. 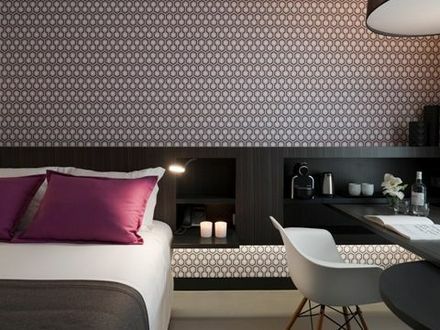 Spacious suite with a touch of glamour and all at once urban with innovative design. Inspired in the essence of the elements of Feng-shui (Earth, Metal and Tree). The space carries out an atmosphere of success and prosperity perfect for a romantic break! The most impressive detail of this suite is the private balcony with a hot tub, which provides a real SPA experience in your Urban Oasis. 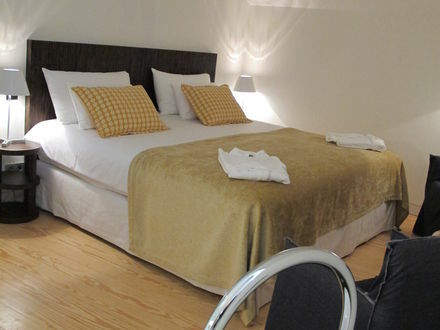 Set of 2 comfortable rooms with two double beds. Tasteful and harmonious decoration based on five elements of feng-shui (Earth, Water, Metal, Fire and Tree). Invigorating environment, inspired by the colors of nature, a true experience for the senses! Inspira is a green hotel in all aspects, so the spaces available for meetings and events are the greenest possible, from energy-saving lamps to recycled paper notepads and video conferencing systems and flip chart. The two existing meeting rooms are air-conditioned and have a maximum seating capacity of 90 theater-style and 60 classroom style seating. The auditorium is equipped with 48 comfortable chairs, projection screen, Bose sound system and blu-ray. We also have a banqueting kit available for your meetings or events. To know the various options click here. Sustainability inspires us, and minimisation is a priority!